Made from top grain leather this is a real functioning organizer with a separate large, zippered compartment to covertly hold your hand gun. 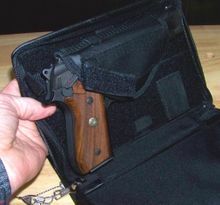 Can hold a full size automatic like the Taurus PT92 AF pictured. 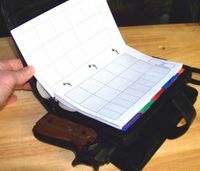 Organizer is filled with day planner supplies, monthly, weekly, and daily planners. Separated by subject dividers, organizer also includes sections for projects, an expense report area, and plenty of notepaper to make notations. 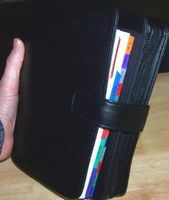 Organizer is fully accessorized with a full size inside pocket, plastic slot for identification, three cardholders, and 6-ring reinforcement to secure all materials in place. Other characteristics include long lasting YKK zippers, reinforced stitching and Velcro leather to open and close the organizer.